A selected group of both Captains and Environmentalists interested in the preservation of the Atlantic Tarpon and its estuary’s here in the USA. I, Captain Gary Giles, have been a tarpon specialist and researcher science 2004 where I headed up and founded the tarpon tagging and DNA project for the Sports Fish Research Institute at Florida Tech under Dr. Jon Shanker. 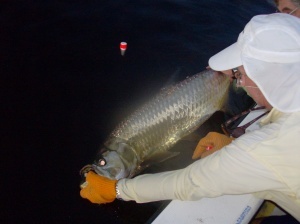 In that time i have caught and tagged over 900 tarpon and tagged and released alive. Sponsors will have an opportunity to not only be directly involved with tracking tagged tarpon (this will be done by us and shared with you), but you will be able to advertise your company on each and every tarpon tag. For a donation of $650.00 per year, your company gets 100 Tarpon tags with your companys name, web address and phone number printed on the tags. This money goes directly to research. We also work with the Florida Wildlife Research Inst. by sending DNA samples of our Tarpon. This this is a win win for you and the fishery and a great advertising opportunity. Each placed tag can be reported back to your company so you can advertise your involvement in the program and even encourage your customers to recapture the fish, and if you choose, win prizes from your company based on those recaptures. Successful recaptures have already been proven. Last year I had two recaptures and more have been reported throughout the state of Florida. Our goals are to study, protect, and preserve Tarpon for the future generations. 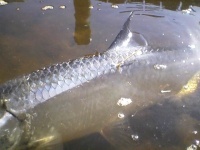 Few people realize that Florida is the only state in the US that is an esturary for Tarpon. President of the Atlantic Tarpon Research Org.